A three-member panel of the Blue Ribbon Commission that has been appointed to review all facets of the Kansas judiciary will conduct two public meetings in Liberal April 27th to hear local concerns and suggestions to improve access and efficiency in the state’s court system, it was announced today. The 25-member Commission was appointed by the state Supreme Court from across the state to undertake a complete review of the court system, the first such since the 1970s, when the Kansas courts were unified. Conducting the public meetings in Liberal will be Commission members Calvin Williams, a Colby attorney in private practice; Bob Boaldin, a Morton County Commissioner, Elkhart, and Commission Chair Judge McAnany. The meetings will be in the theater at the Seward County Community College in Liberal. The first of the two meetings will be at 3 p.m. to accommodate local officials who wish to attend and make their comments. A second meeting to hear comments and suggestions from the general public will begin at 7 p.m. in the same location. What other concerns or issues do you want the Commission to consider? Judge McAnany said the Blue Ribbon Commission has not arrived at any recommendations to make to the Supreme Court, but is meeting at 18 locations throughout the state in April and May as a fact-finding mission. Once the meetings are concluded, the Commission will meet and consider all suggestions and concerns expressed during them. In addition to the information obtained from the scheduled meetings, the Blue Ribbon Commission will have the results of a weighted caseload study of both judicial and non-judicial staff time required to process the court system cases. 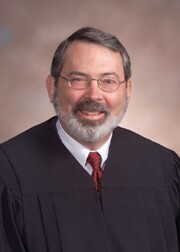 The weighted caseload study is the first review in Kansas history to accurately measure the time and personnel required to process cases by considering such influences as case complexity, the driving time for some judges in less populated areas to travel from court to court within their district, as well as the administrative burdens. Once the Commission completes its work, a report to the Supreme Court will be submitted. It is expected that the report will contain recommendations for action the Court can take on its own authority, as well as action that may require legislative approval or constitutional change.